Shield Powder-Free Blue Nitrile Large Gloves (Pack of 100) GD19 Pack of 1 Powder Free Disposable Gloves manufactured and inspected in accordance with European PPE Directive 89/686/EEC and tested to European Standard EN420, EN388 and EN374. Ideal for chemical handling, food industry, general heavy duty applications. Shield Powder-Free Nitrile Blue Gloves Extra Large (Pack of 100) GD19XL Pack of 1 Shield Powder-Free Nitrile Gloves. Provide superior resistance to chemicals and tearing. Colour: Blue. Size: Extra Large. 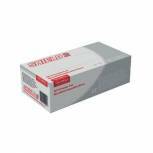 Shield Powder-Free Clear Medium Vinyl Gloves (Pack of 100) GD09 Pack of 1 Powder Free Vinyl Gloves manufactured and inspected in accordance with European PPE Directive 89/686/EEC and tested to European Standard EN420. Ideal for low risk applications such as cleaning, food industries, hairdressing and painting professions. Shield Powder-Free Blue Nitrile Small Gloves (Pack of 100) GD19 Pack of 1 Powder Free Disposable Gloves manufactured and inspected in accordance with European PPE Directive 89/686/EEC and tested to European Standard EN420, EN388 and EN374. Ideal for chemical handling, food industry, general heavy duty applications. 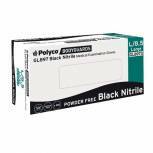 Polyco GH100 PU Coated Size 9 Nylon Glove Black GH0009 Pack of 1 Polyurethane Coated Nylon Gloves. Seamless nylon liner improves comfort during extended wear. Integrated knitted wrist. Open back design improves ventilation. Suitable for household, manual and heavy duty tasks. Conforms to EN420 and EN388. Shield Powder Free Clear Large Vinyl Gloves (Pack of 100) GD09 Pack of 1 Powder Free Vinyl Gloves manufactured and inspected in accordance with European PPE Directive 89/686/EEC and tested to European Standard EN420. Ideal for low risk applications such as cleaning, food industries, hairdressing and painting professions. 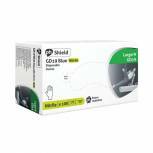 Shield Powder-Free Blue Large Vinyl Gloves (Pack of 100) GD14 Pack of 1 Vinyl Disposable Gloves manufactured and inspected in accordance with European PPE Directive 89/686/EEC and tested to European Standard EN420, EN388 and EN374. Ideal for low risk applications such as agriculture, catering and food industries professions. 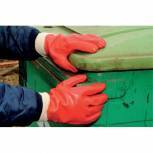 Shield Household Rubber Medium Gloves Pink GR03 Pack of 1 Manufactured from natural rubber latex. Textured palm and fingers for grip. Cotton flock lining. Resistant to diluted detergent solutions. Size- Medium. 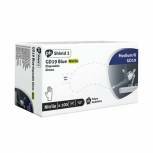 Shield Powder-Free Blue Medium Vinyl Gloves (Pack of 100) GD14 Pack of 1 Vinyl Disposable Gloves manufactured and inspected in accordance with European PPE Directive 89/686/EEC and tested to European Standard EN420, EN388 and EN374. Ideal for low risk applications such as agriculture, catering and food industries professions. 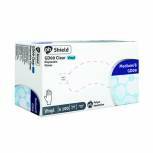 Shield Household Rubber Medium Gloves Blue GR03 Pack of 1 Shield Latex Gloves Blue Pair. Suitable for minimal risk environments and standard household tasks. Cotton flock lining. Medium. 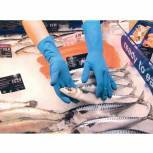 Powder Free Clear Vinyl Gloves, Medical Grade AQL 1.5. Size Small. Qty 10 x 100 Pack of 1 Powder Free Vinyl Gloves manufactured and inspected in accordance with European PPE Directive 89/686/EEC and tested to European Standard EN420. Speciality Black Nitrile Large Gloves GL897 Pack of 1 Black nitrile examination gloves. Manufactured from nitrile butadiene. Powder free to reduce dust contamination. Latex free. Tested for European standards EN420, EN388 and EN374. Suitable for infection control, food and chemical contact. Size: Large. Polyco Crisscross Gripper Glove Size 10 CSP156/MNS Pack of 1 JSP Gripper Glove. Ideal for construction and general handling applications. Excellent wet or dry grip. Supplied on a header card. Conforms to EN420. Orange. Size 10. 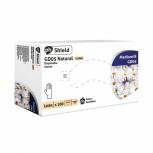 Shield Powder-Free Natural Medium Latex Gloves (Pack of 100) GD05 Pack of 1 Powder Free Latex Gloves for use within Agriculture, Automotive, Cleaning, Food Industry, Painting and Printing professions. All gloves comply with Medical Devices Directive 93/42/EEC and European Standards EN455 parts 1, 2 and 3, EN388 and EN374. 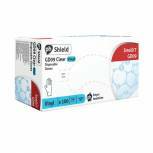 Shield Powder-Free Clear Small Vinyl Gloves (Pack of 100) GD09 Pack of 1 Powder Free Vinyl Gloves manufactured and inspected in accordance with European PPE Directive 89/686/EEC and tested to European Standard EN420. Ideal for low risk applications such as cleaning, food industries, hairdressing and painting professions. 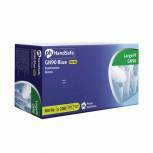 Hand-Safe Blue Powder-Free Nitrile Examination Large Gloves (Pack of 200) GN90 Pack of 1 Blue Powder Free Disposable Gloves manufactured and inspected in accordance with European PPE Directive 89/686/EEC and tested to European Standard EN420, EN388 and EN374. Ideal for chemical handling, food industry, general heavy duty applications. Polyco PVC Knitwrist Glove Size 10 P10R/E10 Pack of 1 Shield Heavy Duty PVC Knitwrist Glove. PVC coated for chemical protection. Knitted wrist for forearm protection. Supplied on a header card. Conforms to EN388. Size 10. Red.